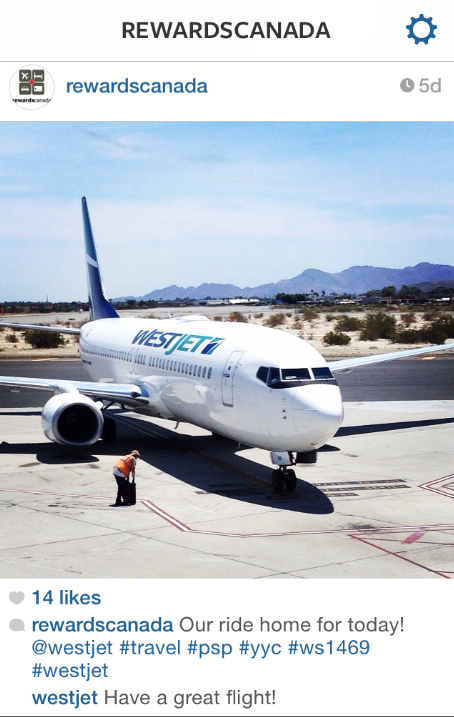 If you follow Rewards Canada on Instagram (if you don't you should at instagram.com/rewardscanada) you'll have seen that our family flew with WestJet to Palm Springs last week. The flights were purchased on our Diners Club Club Rewards MasterCard from BMO. I have had this card since the late 90s and have held on to it for the benefits and the decent 'travel anywhere' redemption option. If you have this card, the American Express Gold Rewards Card or Platinum Card, TD First Visa Infinite Card or several other cards like the Diners Club MasterCard you'll know that they provide the most flexibility when it comes to that overused and overblown saying of Any Airline Any Time and are technically the only cards that should use that saying. Why? Because you can book with whomever you want not through the credit cards travel agency, pick the dates you want, not have to book 14 days out and don't lose point value when using the points for taxes and fees. That is the beauty of these types of redemptions, my points redemption not only covered the flight cost, it also covered taxes and fees and also the preassigned seat fees! Unlike cards such as the RBC Avion or CIBC Aventura, those additional costs (taxes, fees, seat fees) were all redeemed at the same point rate not at a reduced amount. In the end the flights were as free as they get since there was no cash outlaid at all once the points provided a credit against the charge on the account. Now you may say that there are cards that have a better return than the 1.7% that comes with the Diners Club Club Rewards and this is true, to a point. An example is the BMO Rewards World Elite MasterCard, it has a 2% return however the card costs more than the DC card in annual fees plus you have to have all your points up front. With the DC card I could have waited a few months after the charge to redeem points if I wanted to, however I had all the points in my account to do so right away. Plus with a card like the BMO card I would have had to book via their reward site versus doing the booking myself. The DC card is also a hybrid card meaning I could convert the points to various airline and hotel programs (see below for an example) which only a few cards in Canada provide. In fact I keep the Diners Club card in my wallet primarily for the lounge access and the points transfer options while forgoing the approximate 0.3% loss in value on points that could be earned from other cards. Another great benefit of this type of redemption, that is not limited to only Diners Club but a lot of the travel points/hybrid cards is that you still earn frequent flyer miles on your flights and that was the case with these flights as all four of us earned WestJet Dollars on these flights. Another redemption I could have done instead was to convert 125,000 of the Club Rewards Points to Alaska Airlines Mileage Plan and redeem those for YYC-PSP flights. With this redemption though we would have had to pay an $82.40 per person in taxes and fees on the flights or $329.60 in total which I could then have put on my DC card and redeemed points against the charge and come out to roughly to same amount of points used for the WestJet flights. However the flights would not have been direct as they would require a connection in Seattle and rather than 3 hours of travel time we would have looked at nearly 7 hours of travel time! Not to mention, no miles would have been earned on the flights and we would have to pay baggage fees as well since Alaska does not offer the first bag free like WestJet does. When we travel as a family we don't want tons of connections, we don't want to spend tons of time travelling as we value our time immensely so in the end I am very happy with the redemption as I feel it was a great value and who can complain when the entire flight was free! The customer service at Diners Club was great and the whole process of redeeming the points against the charge on my account was easy and painless. This was not the first time I redeemed my Club Rewards Points via their "Tailored Travel" option and definitely won't be the last!